I finished my scrapghan! And what works better for yarn scraps than a granny square blanket pattern! It was nice putting to use all the scraps I had lying around and was fun to remember the past projects as I used them. And best of all, I really love how it came out ! I still have quite a bit of scraps left over so I am already planning what kind of scrapghan to make next. 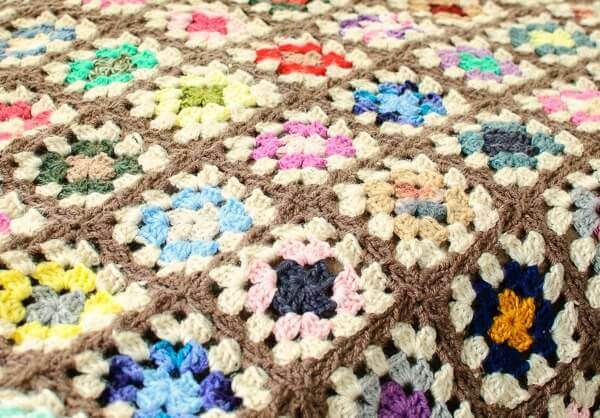 Check out my free crochet granny square blanket pattern below to see how to make one too! Finished afghan measures approximately 43 in. x 58 in. Using the granny square pattern here, work Rounds 1 and 2 using your yarn scraps. Work Round 3 with cream yarn. Make 99 granny squares. Block if desired … you can find my free tutorial on How to Block Knit and Crochet Items here. 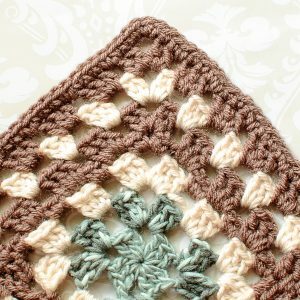 Using taupe colored yarn, join squares using the Join As You Go (JAYGO) method here. Join 9 squares per row for 11 rows. Weave in all ends and tails. Alternating between taupe and cream colors, work granny afghan border here. Now pour a cup of tea, sit in a cozy spot and enjoy your new granny blanket! 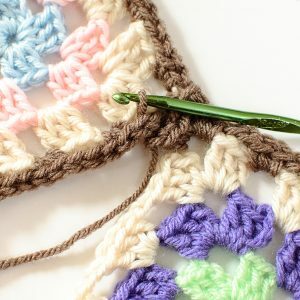 Previous Post: « Granny Square Afghan Crochet Edging Pattern … Finishing my Scrapghan! Oh gosh, this is so beautiful! I learned the classic granny square many years ago but haven’t crocheted in years, Recently my young niece started to learn showed me her work and now I am interested again. Seeing your gorgeous blanket has inspired me! Thank you!! Absolutely love this pattern. Have made one like one shown and am now working on another one using a light sage to join. Will then start another with blue joining. I am keeping the green one for myself and giving the other 2 away as Christmas gift. Love this joining method! 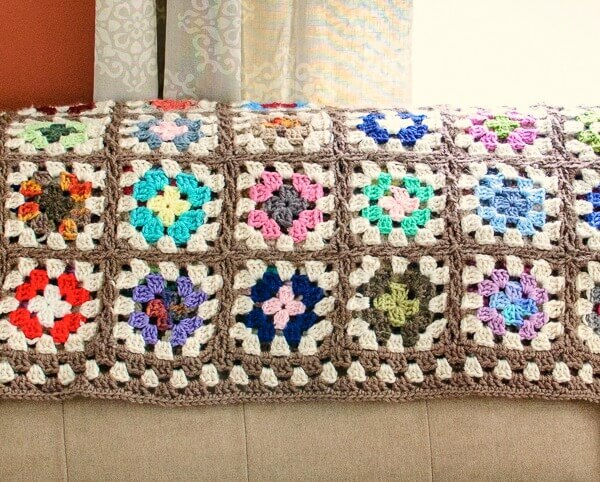 This is such a beautiful afghan…I love how you can join as you go! You always use the prettiest color combos! My daughter has been jonesing for a granny square afghan, and my scrap pile grows ever larger – this is great! Thank you very much for sharing. Such a great idea…I have so much scrap yarn laying around! 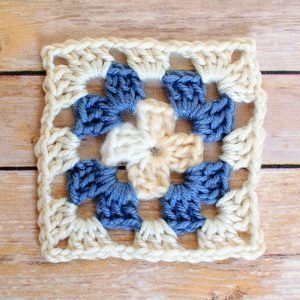 I love the traditional granny square! just beautiful!! I love the colors so much!